Brilliant connection fastbilly1! I decided to try and ID the model & brand of gloves that we can see in the prototyping image from Instagram. I think I did find them! Though it's a bit hard to say if these model of gloves made it all the way through to the final puppet or not. I have to try and find some better images of Growler's hands but the thumbs of the hockey gloves seem somewhat useless to me for movement if they were left unaltered from their off-the-shelf state. The second image is a pair I found via Google image searching that seem to have the same back-of-hand, foam-guard shapes with light grey pin-striping as seen in the prototype photo. 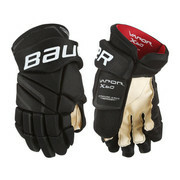 They are Bauer Vapor x60 SR hockey gloves. The only sales pages I could find for that model feature them in the same shape, but in different colors and with bright white pin-striping. Seeing as how they eventually become green, their original colors likely don't matter. However I couldn't find any web stores that still had them in stock. Guess it's time for eBay hunting! I found a pair on eBay though for $80.00. I realize sourcing bot parts has never been a cheap hobby and that's still steep in my opinion, but not nearly as painful as $200. So I decided to take one for the team and buy them. They look correct but the only way to know for sure is to examine them in-hand. If they aren't the gloves we're all looking for, at least we'll know. I've lost money on false alarm parts before so I won't cry... Too much. I'll post pics when they arrive. I received the Bauer gloves this weekend, so here's a photo dump of them and my assessment of their accuracy. I really do think these are a found-part match! The shapes are all present and correct to the screen used version in as many photos and screenshots as I've been able to observe. Like most hockey gloves, movement in the fingers is possible, but doesn't provide a large amount of movement. The main digits are easiest to move (and decently tickle a keyboard) but the thumb is as useless for broad motion as I had guessed- It's only ambulation possible being used for pressing inward to the palm. They are HUGE! I see that they come in slightly different sizes. The pair I found say they are 15"-38cm. I have no idea how we'd discover what size on-screen Growler uses as it's printed on the inside of the cuff but I'm hoping it's safe to say that most of the adult sized gloves are fairly close in scale to each other. I'm certain the gloves used for the show are the all-black variety. That makes the palm sections already dyed black and the need to paint over bright pin-striping in the cracks between the finger foam moot. But it unfortunately looks like it's going to take an act of good fortune to find a fully black pair -or any pair- for that matter. The biggest concern for me and the no.1 telltale detail that these are the real deal and that they kept the gloves as-is was going to be found with those goofy thumbs. This photo highlights the area in which the thumb rests within the glove and how that then attaches to the large thumb guard with a "fabric loop." Next are some screengrabs where you can indeed see the same thick thumb guard and the loops! Now this is "Shadow Growler" (Timmy Growler?) and we've seen that the shadow versions can sometimes vary slightly from the regular versions. Yet, when we raise the brightness on the photo we can not only see that the wrist guard is still present (red outline), but that it's attached to the tube arms with bolts and washers in exactly the same place where I now know the rest of the glove should still exist (blue outline). Which means, beyond being painted and re-colored, the gloves are probably not modified in any other way from their off-the-shelf state! Of course the other obvious dead-giveaway that the wrist guard is present is that Shadow Growler still sports the white letters of the Bauer logo! 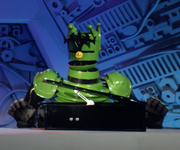 I can also confirm that the gloves' large openings and flaps at the base of the palm area make it ideal for puppeteering with your arm inserted from below- while still allowing plenty of space above your own wrist for the arm-tubing to be attached. So again, I think this model of hockey glove is indeed likely confirmed! 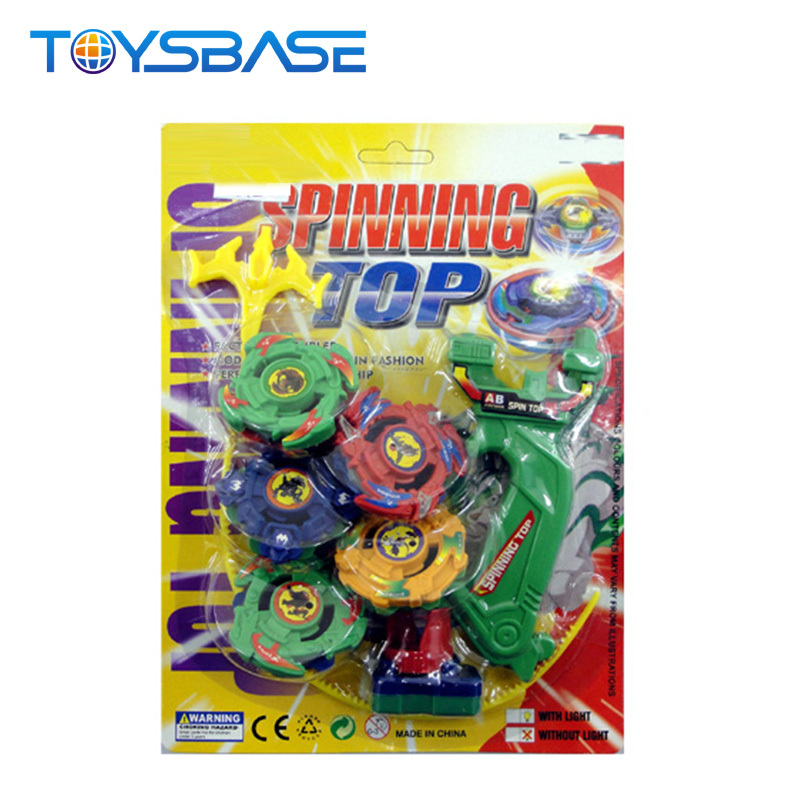 Like most none branded mass produced Chinese products they are sold under a dozen names and often at a stupid mark up (dont ever buy from a dropshipper just get your own Aliexpress account). fastbilly1, you are a miracle worker! Nicely done!